I need to spend more brain time studying auction results. As luck would have it, my trusty Sotheby's alert hit today with news that results are now available for the auction of Western Manuscripts and Miniatures. The results report on the sale of 36 lots of rare and exquisite illuminated manuscripts, most on vellum and hand written and illustrated by generally unknown book artisans of the period. Created in monasteries, private scriptoriums, or by individuals for personal use, these are truly unique works of art. 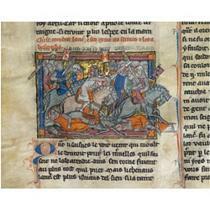 The 36 lots sold for $4 million plus, suggesting no recession in the rare manuscript trade. My personal favorite from the auction was the Amuletic Scroll of the Alchemist Johannes Michael, In German and Latin, Decorated Manuscript on Vellum [Germany, Late Sixteenth or early Seventeenth Century]. "a scroll (5 membranes), 2710mm. by 95mm., with coloured roundels on the obverse containing complex alchemical talismans, each above a line or so of text in cursive black ink in German or Latin explaining their use, on the reverse a number of prayers and prayer-like texts listing names of Evangelists and alchemical terms, and naming the owner of the scroll in lighter brown ink as Johannes Michael, these texts separated by elaborate crosses and roundels, some minor rust holes at top edge of first and second membranes, else in excellent condition"
"This scroll is an alchemist's practical reference tool from the greatest years of the study of this philosophical and pseudo-chemical art. It lists some 34 designs for alchemical talismans (presumably to be painted on walls, doors or the body), littered with the traditional symbols for mercury, copper, gold and at the head of one of the larger talismans, the elusive philosopher's stone locked within the Seal of Solomon. 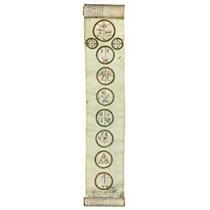 The simple talismans at the beginning of the scroll offer protection against neid und haß (anger and hate), den bösen geiß (the evil spirits) and Zauberij (witchcraft). Those at the end incorporate a number of simple units as well as symbols taken from an angelic alphabet (evidently influenced by the so-called Alphabet of the Magi invented by the celebrated astronomer and alchemist Paracelsus, 1493-1541), and offer more specific protection against failure in war and imprisonment." I own a contemporary Alchemist Scroll and paid no where close to the $33,500. this cost at auction! Visiting auction sites pre or post-auction is worth the time spent. In this case learning a bit about the Grail lore and seeing a real alchemist scroll is as close to I'll ever get to these pieces of history.